Meet the Flockers—Indy’s urban chicken farmers—plus look back on Indy 500 Snake Pit hijinks, the State Fair food romp, and a pair of brew-drenched events. Trendy glass honey pots by Blomus and delicate, hand-painted egg crates would make Old MacDonald jealous, but the wares veer practical, too. 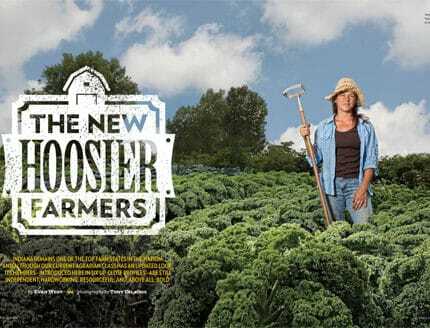 If you believe that Indiana farmers are weather-hardened old men who grow corn and soybeans, you might look at these tidy patches of naturally raised produce and see a garden—and, in the pretty thirtysomething who tends them, a gardener.